Promethean has updated its online classroom service ClassFlow to better address blended learning environments. The education technology company has also introduced a new program that allows teachers to capture and share their Windows and Mac screens with students. 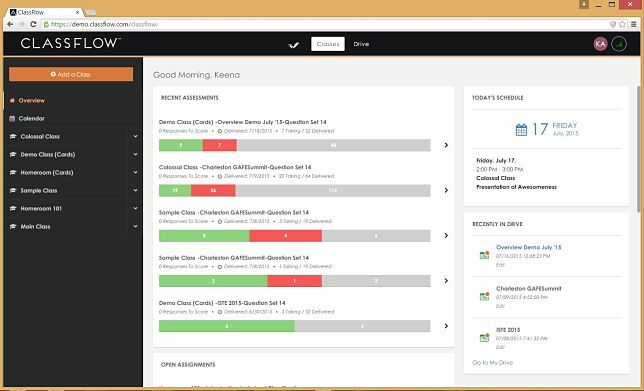 The latest iteration of ClassFlow, a classroom delivery application, allows schools to assign students their own accounts and provides updates to the teacher interface designed to streamline certain operations. The "school edition" of the program, which offers the student accounts, lets students access assignments and other materials after school hours and provides a "digital backpack" — a cloud-based storage drive where students can upload and organize their own files. Previously, said Keena Antonelli, the company's head of software product marketing (and a former classroom teacher), students connected to ClassFlow by logging into a session through a class code provided by the teacher. The only way to access each class was by entering that unique code. "With the new release, students now have their own identity within ClassFlow," she said. "Now, students have one place to access all of their classes, assignments, calendars and more. They simply login to ClassFlow [to] see all of their classes." The new school version also streamlines the student roster process for teachers. They can load class rosters right from the student information system or let students self-register for classes. "Before, the only option was for teachers to set up each class and type in the roster for every class," explained Antonelli. Teachers will be able to use the new student accounts for sending assignments and other digital content in and out of class. An assignment tracker feature enables them to monitor student progress on outstanding assessments and assignments. Whereas the previous version of the software had a landing page where the teacher could access classes and resources, the program now includes a dashboard (pictured above). "The new dashboard gives teachers reporting overviews of various items, such as a quick view of results on the last five assessments they gave, or a summary of outstanding assignments, as well as their calendar and class overviews," Antonelli said. A new program, ClassFlow Desktop, is software for Windows and Mac OS devices that lets teachers capture and share their screens to display content from a website, document or application. The program includes a built-in Web browser, an "instant" whiteboard and access to content on ClassFlow Drive. "Through blended learning initiatives, students can connect to learning resources, their teachers and their peers wherever they are, enabling learning to continue beyond school hours," said Chief Marketing and Products Officer Scott Cary in a prepared statement, concluding that the purpose of the latest updates was to help educators “seamlessly implement hybrid learning models and empower students to take ownership of their learning."